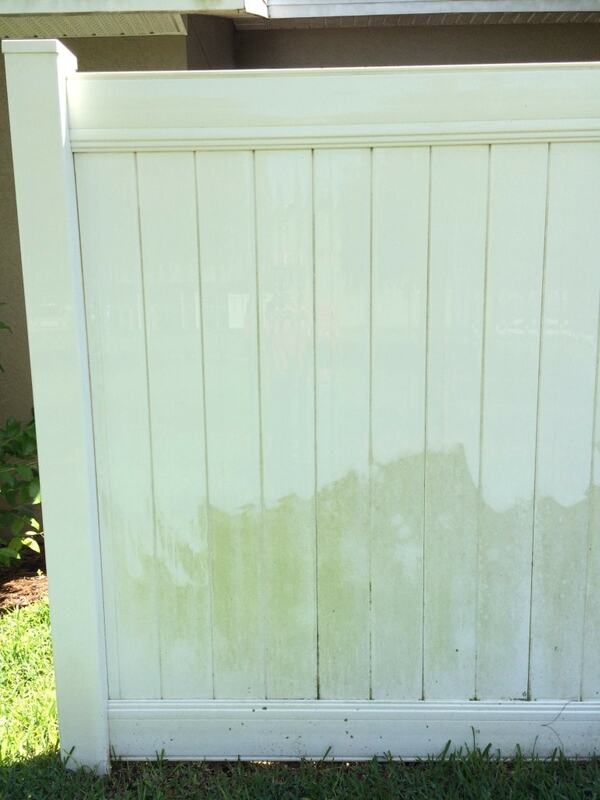 Have a white plastic vinyl fence that is dirty, moldy or covered with mildew? 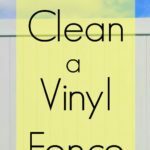 Then you’re likely wondering how to clean a vinyl fence! 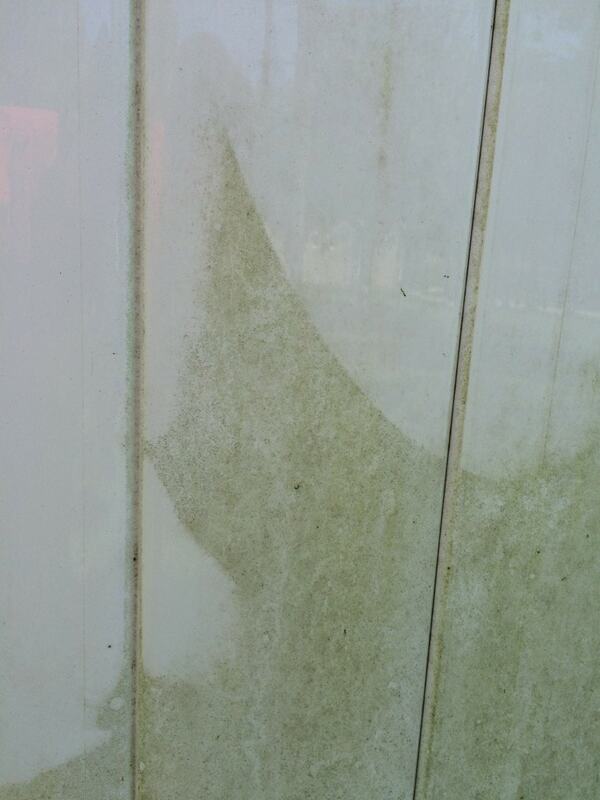 We all end up having this problem when you own a vinyl fence – and it doesn’t help matters that they are usually white and show dirt so easily! Cleaning a white vinyl fence can be easy, cheap and it just takes a few minutes. So there’s no need to keep putting it off! Exposed to the outdoor elements every day, all day, your vinyl fence WILL get dirty, no way around it. Cleaning a vinyl fence regularly with routine maintenance will keep your white fence from becoming gray with dirt and dust, or spotted with green from mold and mildew. The good news? 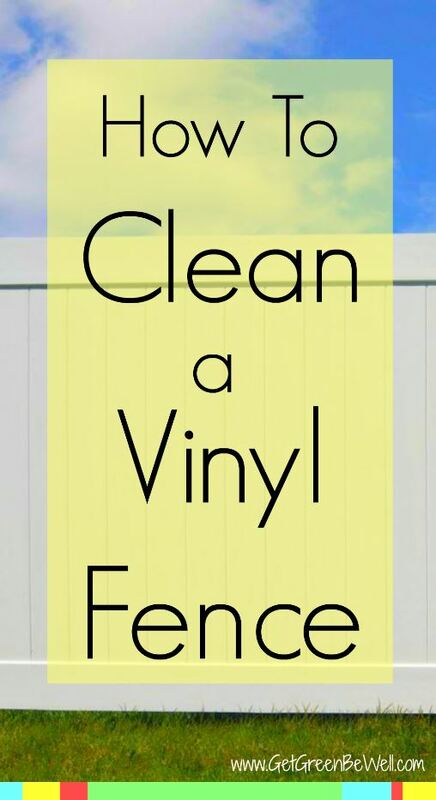 All it takes to clean a vinyl fence is something you’ve already got in your home – vinegar. Not every type of vinegar is suitable for green cleaning, though. You’ve got to make sure you know what type of vinegar to clean with. Planning on using lots of vinegar to clean? Just get the big bottles of vinegar for a few bucks like this one. They’re more economical than buying 16 oz. bottles at the grocery store. 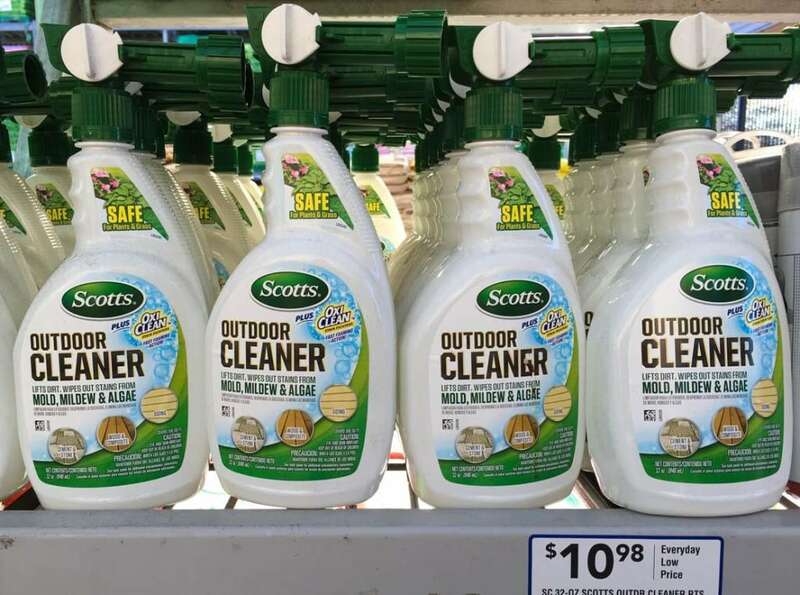 Now, I’ve seen those bottles of outdoor fence cleaners at the garden center checkouts of big box stores. They are in the aisles of chemical-based cleaners that are designed to help make your life easier, but only drain your wallet of money. If you could use a natural product that worked just as well for less money, would you? I don’t think you should have to spend a lot of money, and use a product with lots of warnings, if there is a natural alternative that works just as well for less money. Do you? Then, just dip a rag in the solution, and wipe down. Alternatively, you could use a vinegar and water solution in a spray bottle and spray the entire fence. Then you’ll need to wipe down the fence with a cloth to remove the grime. You might need to cover the same area a couple times to remove caked-on residue. Hose down the fence afterwards to remove all vinegar residues and solid particles. Do keep in mind that vinegar is an acid, and therefore vinegar can kill weeds and plants when applied directly. This is a very watered down solution, though, but still do take care to not leave too much on the ground below if you’ve got thriving grass or flowers – or at least hose it down to dilute the solution so that it does no harm. I’m telling you, cleaning doesn’t have to be rocket science. You don’t need a separate bottle for everything. And you don’t have to spend tons of money. If you just want to buy a product that is already pre-made to clean fences, then there are a few organic options, such as Eco-Reviver which works on both wood and plastic. But let’s be honest, it’s going to cost a LOT more than just vinegar. P.S. Try this trick on siding, too! This is just ONE of the many ways to easily clean your home without nasty chemicals. Check out my Ultimate Home Detox Guide to create a healthier home for you and your family today! And check out some of my free resources in the Get Green Be Well Academy for living a more simple, natural life. It seems like vinegar can clean anything. I’ve never thought of installing a vinyl fence because I don’t think it could stay clean. Who knew that the solution to that problem was so simple. I know! Vinegar cleans just about anything, it feels like! I like saving the money and exposure to nasty chemicals and relying on a kitchen staple to do the work! Thanks for writing! Last night, we had a huge storm that muddied up the vinyl fence that is around my yard and so I plan on cleaning it today. I am really glad that this post mentions a vinegar-based cleaning solution, because I don’t like to use chemicals when I clean and I was worried that I would have to. However, would it be safe to use a hose to help clean the fence once I have scrubbed it with the vinegar solution? We think so! Good old fashioned water pressure cleans and waters the lawn underneath, too, with no chemicals! I’m thinking of getting a vinyl fence and am wondering about the upkeep. 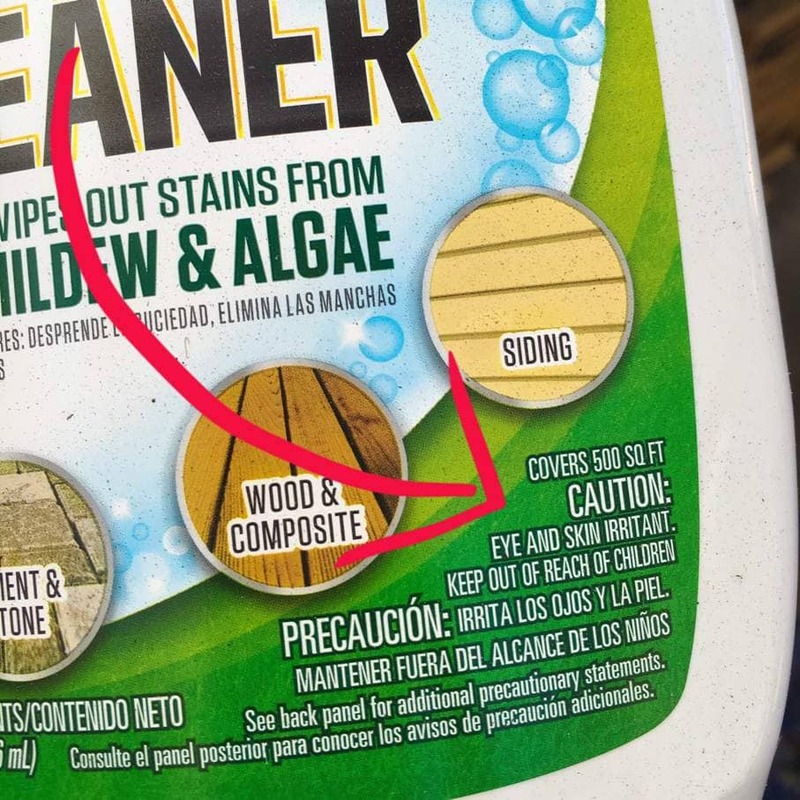 Thanks for pointing out that all you need to clean your vinyl fence is some vinegar. You also mention that you might have to increase the amount of vinegar to water when cleaning vinyl that is really dirty. I also think that vinyl is a great option for fencing because it’s so easy to install and tends to look great in pretty much every yard. So true! More vinegar = stronger cleaning! I had a strong solution of vinegar and it did not make a dent????? I will do it one more time. How long should you wait before using the water??? Hi Janet, How long has the dirt and grime built up on your fence? If it’s a heavy coat and has been on there for a while, it might take a couple tries to get your fence clean. I’d estimate maybe waiting about 15 minutes to let is sink in and loosen the grime. Hopefully it’s not a problem where the dirt has been etched in over time and really hard to come off. Janet, Wish it had worked!!! Sometimes you got to use something stronger, but it’s always great to try the inexpensive and natural solutions first. Good luck! I use warm vinegar and dawn/Ajax dish detergent (50/50)on my shower it cuts the soap scum every time… Going to try this on my vinyl this afternoon and see how it does..
Love this trick! Sounds easy and bet it works great. Let us know how it did! Worked great! I did add palmolive to the water and a lot of vinegar then I wet it with the hose, and when I wiped it with a Mr. Clean eraser, it wiped right off! You do have to wipe, it won’t just come off with a hose but the results are dramatic. Thank you! Lucila, Awesome! Yes, you do have to physically wipe the fence to get as much nasty stuff off as possible. But isn’t it amazing at how well it works? So glad you found success! Thanks for sharing! I love that you used a vinegar wash but if you truly want to stay away from chemicals, dump the Magic Erasers. Those things are chock full of corrosive chemicals and toxins and have resulted in scores of very serious contact burns and poisonings. Much safer with vinegar and a mild non toxic soap such as Ivory or Dawn. Lana, I totally agree. I avoid all of the eraser sponges like that one for the same reason. A reader had suggested that it helped them get off more debris and dirt. I wanted to pass along that information should it help readers, but it’s not my first choice. FYI, you need to check your fence warranty as there is a protective sealer on vinyl fencing. You remove the protective sealer your warranty also dissolves. This also includes use of pressure washers. Check with the manufacturer for their recommendation of cleaner to remove mold, mildew and/or dirt. Saves you a lot of future disappointment.